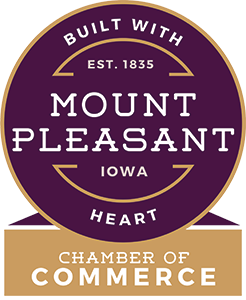 When you join the Mount Pleasant Area Chamber of Commerce, you are investing in Mount Pleasant and Henry County’s future. Through the Chamber, you can broaden your business contacts and referrals, enhance your leadership and professional skills and participate in projects that make a difference in our community. The Chamber Ambassadors are the “Welcoming Arm” of the Chamber that conduct complimentary groundbreaking or ribbon cutting ceremonies for any business opening, expanding or moving to a new location. Ambassadors also help with Chamber events. This group meets quarterly at 4:00 PM and is open to all Chamber members. This committee focuses on facets of the community that have an indirect relationship with economic growth, such as recreation, health & wellness, beautification and education. Their efforts are intended to make the community more attractive to existing and prospective residents, workers and businesses. This committee meets quarterly and is open to all chamber members. This committee plans the Chamber Olympics held in April and is a great networking opportunity for members. Participants enjoy a fun event designed to foster team-building and camaraderie among the business community. This committee meets as needed to plan the event. Young Professionals is a group providing networking opportunities, leadership skills, and social events for emerging leaders in our community. This group is open to Chamber Members who are under the age of 35. Our goal is to meet on a quarterly basis. This committee provides leadership, information and advocacy that enhances the economic environment and represents the political interests of the Mount Pleasant/Henry County business community. This committee meets on the second Tuesday of each month at 8:00 am and is open to all chamber members. This committee consists of those individuals with direct responsibility to fill current vacancies in our local workforce. This committee of human resource professionals meet quarterly or more if the need arises. The FAN Club is a group of retired and individual members that are interested in what is happening at the Chamber and wants to stay abreast of the community growth and development. This club is open to all retired or individual chamber members and meets on a quarterly basis. This committee plans the Fun Day Golf Outing every August and is a great networking opportunity for members. Participants enjoy playing 9 holes of golf and the opportunity to play on-course games, win prizes and show their support of the MPACC. This committee meets as needed to plan the event. This committee oversees Chamber member growth and retention, fundraising events, marketing and communication for the Chamber. This committee meets on the first Thursday of each month at 8:00 am and is open to all chamber members. If you would like to join a Chamber Committee, please use this flyer and return to Timber Haschemeyer at the Chamber.